Last sunday we were up all night with a high fever and tummy trouble. Same for Monday and Tuesday. Wednesday seemed pretty normal and Thursday all snot broke loose and everything went downhill from there. Thursday, Friday and Saturday were full of boogie wipes, disney movies, hacking coughs, humidifiers and vicks. THEN, Saturday night, the hives started. Maybe I live under a rock, but I had never even heard of hives from being sick. But hives we had. And tons of them, everywhere. So to urgent care we went. Now, they finally under control and hopefully my girly will get to participate in the fall festivities tomorrow and friday at her school. 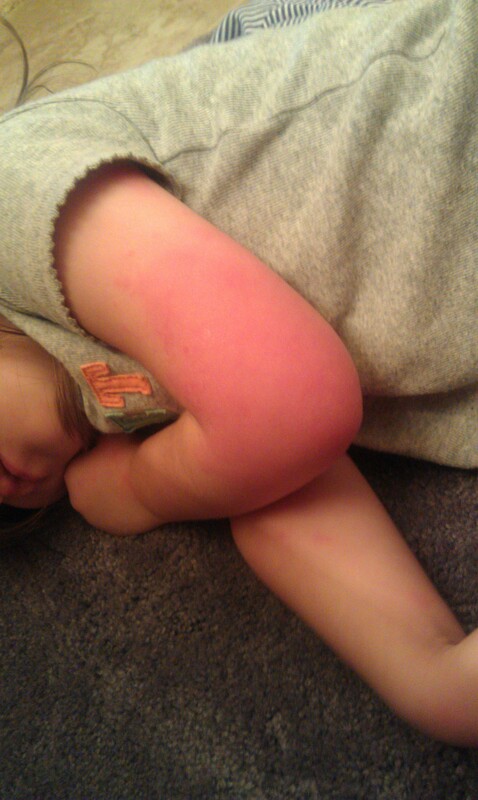 This was her worst arm, which was better than both legs and her belly.